The Precious Ring: Lost and Found. The Importance of Jesus Family. My friends John and Kathy Butler wrote on Facebook yesterday: “We arrived home from a walk at Burrator (Burrator Reservoir on Dartmoor in Devon) with the grandchildren this afternoon when Kathy realised she no longer had her mum’s wedding ring. We drove back to the first of several stops where the children were playing and started to search without any hope. Have you ever come close to loosing something very precious to you? The Pharisees: Who hated Jesus and plotted his downfall. Accuse Him of being Possessed by Satan. The Family of Jesus: His mother Mary and his brothers. Moved with genuine concern thinking Jesus was mad. The Crowd in the House: Who were sitting around Jesus, lapping up His teachings. We’re going to see that how we respond to Jesus is crucially important: Because ONLY those who LOVE Him will be the ones who are SAVED. We’ll know that we LOVE Jesus, if we are being obedient to the Commands of God, they’re no longer commands, but promises for our abundant life. 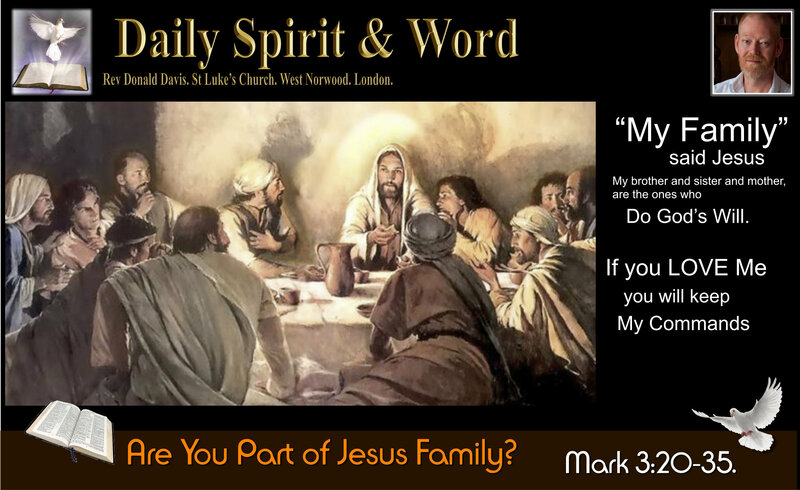 In previous Chapters Mark has been building a wonderful picture for us about who Jesus is, and why He had come: We’ve seen Him debating with the Pharisees (The Religious Leaders of Jesus time). We’ve noted that He selected 12 out of the many thousands who were following Him, designating them Apostles (Sent ones: to preach, teach, heal and deliver). Today, we discover that Jesus is in a house, with so many people that it gets impossible for Him to even eat. Whilst Jesus is busy; healing and teaching, his family arrives, they’ve come to get their precious Son. Also another group of the old adversaries have arrived the Pharisees, they’ve not come to save Jesus, but to condemn Him even more. 27 In fact, no-one can enter a strong man’s house and carry off his possessions unless he first ties up the strong man. Then he can rob his house. Beelzebub means Lord of Flies: The god of Ekron. “The Dung God.” Imagine that, they’re accusing Jesus of being filled with the Demons of the Dung god. They’re accusing Jesus of being Demon Possessed. Divided Kingdom: We’ve seen it in History: Greece, Rome, (Empires crumble from corruption / division within). A divided KINGDOM cannot stand for very long. Divided House: We’ve all see how families fall out and they don’t stand for long: Kardashians. Earthly families that fall apart. Normally over something small: An inheritance, money, finances, jealousy, anger, arguments, etc… A divided house cannot stand. Divided Person: Satan Opposing Himself: Nah! That’s just dumb. Foolishness of the Pharisees. But we also see this in earthly terms too: a person who’s hell bent on self-destruction: through drink and drugs. Last week I gave the example of Amy Winehouse: Hell bent on self-destruction. She succeeded. Such a sad loss for all who knew her, but ONLY Jesus could have saved Amy Winehouse. After explaining the parable Jesus turns around their accusation: He’s not filled with a Demon Spirit, but the Holy Spirit and now they are guilty of committing the unpardonable sin: by accusing Jesus of being filled and moved by a Demon Spirit they’re Blaspheming against God the Holy Spirit. Have you ever said; “O God!” or “OMG” or “Jesus Christ”? : When you hurt your toe, couldn’t get parked, stuck in traffic, arguing with someone when you are angry? Even in those situations using God’s Name in any format: It’s still Blasphemy. I don’t believe that if you are filled with the Holy Spirit you’ll ever take God’s name in vain and not know about it, how serious it is. At best, It hurts your relationship with God. At worst it cuts you off from Him if you do it knowingly. But to Blaspheme against the Holy Spirit is a sin that can never be forgiven. Verse 29. What does this mean? Blaspheme The Holy Spirit. It’s to know God and His purposes and yet still be in opposition to Him. If you’re still feeling guilty for your sin: You are OK.
You love Jesus, but still fail and fall: You are OK. Your guilty conscience proves there’s room for repentance; and getting right with God again. 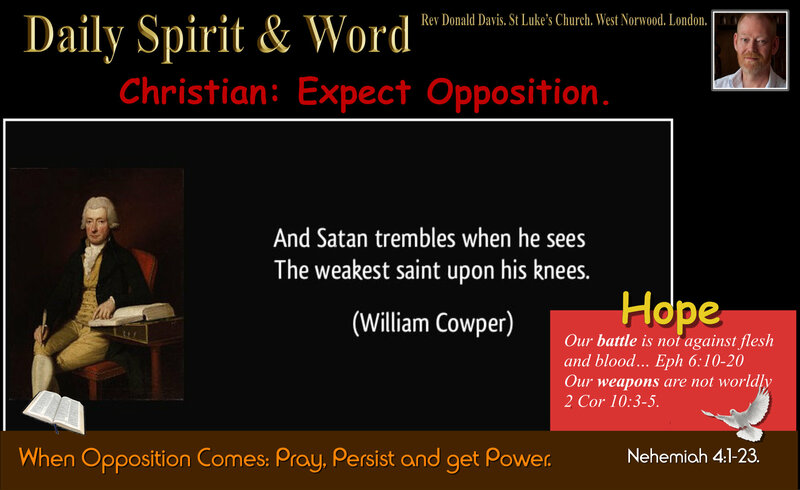 However: If you say that you know Jesus: And are Opposed to Him: You are definitely on dangerous ground. I believe that it’s possible to be forgiven every sin: Apart from this one. My Friend: A Young Christian: In RN Got home on leave to find his wife had been cheating on him. He Cursed God. Felt that he had committed the unpardonable sin. For over a week he avoided our early morning prayer gatherings. He eventually came back one day, but he was unusually quiet: We were reading Psalm 40 and then we began praying. I was praying in tongues: I looked up and his face was streaming with tears. He burst into tears and let it all out. (Tongues are good sometimes). He confessed to shouting at God. Said some terrible things to Him. He thought God wouldn’t forgive him, he’d been pleading but had no peace. But after coming to prayer and hearing God’s Word: Even though He’d got angry with God. Now he knew that God had forgiven him. He was hurting: He had believed that once he became a Christian, then everything would be sunshine and roses in his life. Now he finds his wife had cheated on him. He was broken: He was mistakenly convinced that everything in life would be easy now. He cursed God, because he had believed a lie, But he came back to Jesus. Do you want to know what a man on fire is like? From that day on he told everybody about Jesus and many more sailors came to faith. A life forgiven is a life transformed. The Blasphemy: Against the Holy Spirit: Is KNOWING: Jesus, His Person, His purpose and deciding to oppose Him. It’s going against God’s Holy Spirit. Being angry with God: Is not the unpardonable sin, but we may still need to repent and ask for His forgiveness. (Note: The Psalms are full of people who are hurting and shouting out to God about their predicament in life). They made a mistake: Instead of going in themselves to see Jesus, they send someone else in. Loosing Something Precious: You’ll go looking for it. Like my friends with the Wedding Ring. When you are about to loose or have lost someone precious: You’ll move heaven and earth to get them back. Jesus is precious to His family too: His mother and brothers had come to get him; propelled by love and genuine concern. They are GENUINELY worried about Him: “People were saying, “He’s lost his mind”, “Your son has gone mad”…. His family were not opposed to Jesus, but were only moved through caring concern: We all know they needn’t have worried. Jesus was OK. But they made a genuine mistake through loving concern. How many times have we made a mistake about Jesus? Not understanding Him, Not following Him the way He wants us to? We know from the Bible that Jesus was close to His mother Mary and his borthers; She was there at the Cross as her precious son died. His own brother James becomes a key leader in Jerusalem after Jesus’ death on the Cross. It was only a mistake, but through genuine love. What Jesus said is surprising: “Who are my mother and brothers?” Verse 33. Imagine that, what an insult it could have been to his family outside the house that day, but Jesus was teaching the crowd. He looked around the room: At the people gathered there: and answers his own question: “Whoever does God’s will is my brother and sister and mother.” Verse 35. You know something my friends, we KNOW that we KNOW Him if we LOVE Him. You know something else my friends, we KNOW that we LOVE Him if we are living in obedience to God’s will. Jesus said, “If you truly love me, you will obey my commands”… It’s a PROMISE: You will obey my commands. Jesus also said, “Come unto me … my yoke is easy (Commands), my burden is light (not difficult)… You’ll want to be obedient to Jesus when you’ve come to Him in faith and received Him as LORD. Only then is the obedient life possible, through the indwelling of God the Holy Spirit, Jesus gives us the POWER to live the loving obedient life. How are you getting on at doing God’s will today? How are you getting on a living the Christian life? Are you living in accordance with the will of God? If you are NORMAL: Then there will always be areas in your life that God is working on. God has made you into a Saint: The moment you trusted Jesus as Lord and Saviour. God is making you more Saintly: Day by Day. He will finish the good work He began in you. (Philippian 1:6). You are very precious to Him. Family might abandon you, friends may leave you and let you down, but Jesus never will leave you. Family: Like those around about Jesus; who prove they LOVE Him by being obedient to God’s Commands. God’s will. Which position are you in today? Stay full of God’s Holy Spirit: Ephesians 5:18. God is the God of FREE REFILLS. I heard about a Clergyman who told his children in McDonald’s they can have only one coke. Because he couldn’t afford to keep paying for a refill. However, on holiday in America you can keep coming back and filling your glass again and again as much as you like. The Holy Spirit is a bit like that; you get filled with the Holy Spirit once you trust in Jesus, but you need to keep being filled with the Holy Spirit every day. First things first: you don’t come to Jesus apart from the Holy Spirit. In Titus 3:4-6, we’re told that God “saved us, not because of works done by us… but by the washing of regeneration and renewal of the Holy Spirit whom he poured out on us richly through Jesus Christ…” You can’t become a Christian without the Holy Spirit. And when you become a Christian you don’t receive 2/3 of God, as if the Holy Spirit comes later. 2 Corinthians 1:22 and Ephesians 1:13 tell us that the Holy Spirit seals us and guarantees that we belong to Jesus. When you put your trust in Jesus Christ, the Spirit seals you. But in Ephesians 5:18, Paul commands the church to “be filled with the Holy Spirit”. The English language doesn’t quite do justice to Paul’s intent here. In the Greek, this command is a present imperative, indicating that this isn’t speaking of a onetime filling, but rather a regular pattern of being filled. So “go on being filled with the Holy Spirit” is more like it. This makes some of us nervous, but it was normal language in the New Testament. In Luke 4:1, Jesus is described as being “full of the Holy Spirit”. In Acts 4:8, Peter is “filled with the Holy Spirit”. In Acts 9:17, Ananias lays his hands on Saul so that he can be “filled with the Holy Spirit”. Barnabas is described as being “full of the Holy Spirit and faith” in Acts 11:24. And lest you point out that all these references just mention one person one single time, look at the three separate instances in Acts when the disciples are said to be “filled with the Holy Spirit”. First, in Acts 2:4 they’re “filled…” and begin to speak in tongues. Second, in Acts 4:31 they’re “filled…” again. And then in Acts 13:52 they’re again “filled with the Holy Spirit and with joy”. Why else would Jesus describe the Holy Spirit as “rivers of living water” (John 7:38) and not a pool? A river is a constant flow whereas a pool is a dormant supply. God reconciles us to himself through Jesus, and by the work of the Holy Spirit, and then longs to continue to fill us and fill us and fill us again. He really is the God of FREE refills, but we NEED Him every single day. Go on being filled with God, the Holy Spirit today my friends.